“Then the epiphany. I didn’t need a drift boat, I needed a raft. ” Alex Cerveniak walks through his decision to move from a hard boat to a Stealthcraft Raft. All Hatch reels are made in the USA in Southern California. Their unique design allows for a since piece cage and a single piece spool. Through their use of carrying sized arbors on the spools a single reel can fit into a range (three) of line/rod weight classes. The OPST Comando Skagit Heads are the result of decades of focus on sustained anchor systemology (SAS) by Ed Ward and Jerry French. With the hint of fall in the air, what better time to brush up on our quest for Great Lakes steelhead than with a review of Rick Kustich’s book. Advanced Fly Fishing for Great Lakes Steelhead is a sort of follow up book to Rick and Jerry Kustich’s 1999 book Fly Fishing for Great Lakes Steelhead. Mossy’s Fly Shop and CrossCurrent TV teamed up for this great video on how to create loops in various types of fly line… Lots of great info! There is no golden rule to frequency of line cleaning… basically if your floating line isn’t floating, its time to clean it. Geoff from Scientific Anglers/ Ross shows you how to keep your line in top performance. 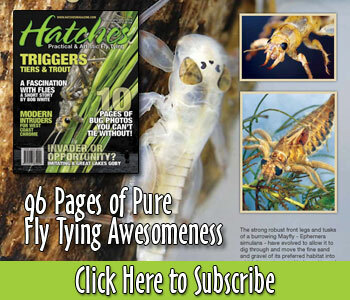 10 featured customer product reviews for Green Caddis Outfitters fly boxes, scissors and fly tying hooks.